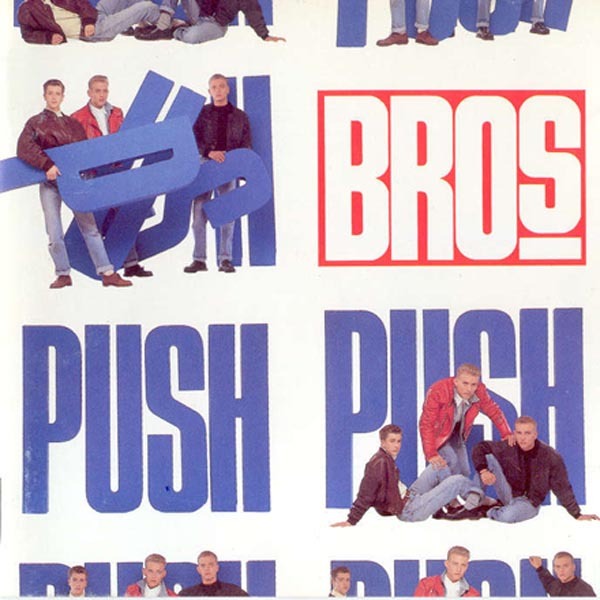 Today’s POP RESCUE is the debut 1988 album Push by trio Bros. When this album was released, the charts went crazy for them (as did my sister). It’s only 10 tracks long, yet it spawned 6 singles, and gave the trio huge exposure. The album opens with the catchy #2 debut single, and that question, When Will I Be Famous? This is a great track, and one that could have been quite ironic had they have failed.. but thankfully it was a hit, and it’s the perfect opening track here in all of its 5 minute 2 second glory – complete with cowbells, and different tempo segment. Then we’re straight into second single Drop The Boy with its ‘shoodla-doodlum-doo-dah-day‘ trademark growling opening vocal snarl from Matt Goss. This is a slower track, and not as catchy, but nonetheless provided them with another #2 hit, which kept the momentum going. Ten Out Of Ten is our first foray into album track territory, and this is also a ballad. The track is a little bit musically clumsy on the synth, but it feels like something you’d find on a Pet Shop Boys album, which is unsurprising, considering the groups had the same manager – Tom Watkins. Liar is very 80s, and sadly it’s a bit of a filler on this album, whilst inoffensive, it doesn’t really do much. Love To Hate You is a vast improvement, and whilst it isn’t a cover of the Erasure track, it is at least more interesting and catchier than Liar. I Owe You Nothing is up next, and it’s a belter of a track. It’s difficult to understand why when this was first released in 1987, it got as far as #88 in the UK chart. A year later, as the third single, it was their first and only number one UK single. I think it’s their best song, with When Will I Be Famous? a close second. It comes complete with up-tempo beats, a great bass line, and some trademark Goss snarly vocals – ‘ooh er, nothing at all‘. I Quit, their fourth single, is up next. It has echoes of I Owe You Nothing musically and vocally in the chorus, alongside a slightly reminiscent semi-James Bond styled guitar line. Track eight is It’s A Jungle Out There, and it Matt’s high vocal ‘wows‘ remind me of their contemporary Michael Jackson. This is a good strong track, but definitely would have been a bit out of style as a single. Penultimate track Shocked is pretty poor. It’s lyrically cringeworthy. ‘Shocked, shocked to the core. My very existence has been thrown out the door. Couldn’t sleep, couldn’t eat, Couldn’t believe the news off the street‘, Matt sings, like a 14yr old. Obligatory 80s saxophone puts in an appearance here too. Final track is the wonderful Cat Amongst The Pigeons, which I first remember hearing on the BRITS 89 double album. This was the final single from the album, and was released as a double-A at Christmas time with a cover of Silent Night. This track is perfect – musically, and for Matt’s vocals, and the perfect way to end this debut album. ‘BROS are the BOOGIE‘ reads the sleeve, which seems odd considering there isn’t a boogie to be heard. Still, this album is a great pop debut, and alongside their squeaky clean pop image, it’s clear to see how they found such success. Craig Logan left in 1989 and focussed on songwriting and management – winning an Ivor Novello Award for the Kim Appleby hit Don’t Worry. He has since worked with Tina Turner and Robbie Williams, and is also responsible for having signed Pink. The twins Matt and Luke Goss continued to record two further albums before Bros officially split in 1991. Matt has continued his music career, and regularly releases albums and performs in the USA. Luke, became an actor, and has starred in numerous films since 2000. In 2008, there were plans for a reunion, but the trio never reformed. In 2016, the twins announced that they would be returning with a series of concerts, but later scaled this down to a smaller number of dates in 2017 and released their comeback single Love Can Make You Fly. 1988 UK CHART POSITION: #2, and certified 4x Platinum. POP RESCUE COST: £3.23 from eBay. Posted in 1980s, BrosTagged 1988, album, Cat Amongst The Pigeons, Craig Logan, Drop The Boy, I Owe You Nothing, ITV2 The Big Reunion, Luke Goss, Matt Goss, Push, review, Silent Night, Tom Watkins, When Will I Be FamousBookmark the permalink.